I once thought that, as my aged increased, so would my ability to be self-reliant. In recent years, however, I’ve realized the opposite to be true. The people nearest to my heart are not only critical parts of how my everyday life functions—they are essential aspects of who I am. In some cases, actually in one very special case, they can even be the best part of who I am. That case is my husband, Ben. It’s our five-year wedding anniversary today, and I’m celebrating with a renewed appreciation for the role he plays in my life and a giant plate of Chocolate Mousse Cupcakes with Whipped Strawberry Cream Cheese Frosting. Actually, in the spirit of total honesty, I’m first celebrating with a nap. I arrived home from Europe late last night so that Ben and I could be together on our anniversary. If you are wondering if the irony of my leaving Paris to be in Wisconsin for the sake of romance has escaped me, it has not. Although the Paris-to-Wisconsin scenario merits some situational humor, I wouldn’t trade a last night in front of the Eiffel Tower or plate of croissants for a chance to spend a milestone evening celebrating with the person I love so dearly, both for who he is and for who we are together. Of course Ben and I both would have loved for him to join me in Paris instead, but since that wasn’t an option, we are going to have a magnifique evening in Milwaukee instead. Could Milwaukee be the under-appreciated Paris of the Midwest? We are about to find out. Although five years of marriage might seem insignificant when compared to a couple who has been married for 50+ , to me it is still meaningful. 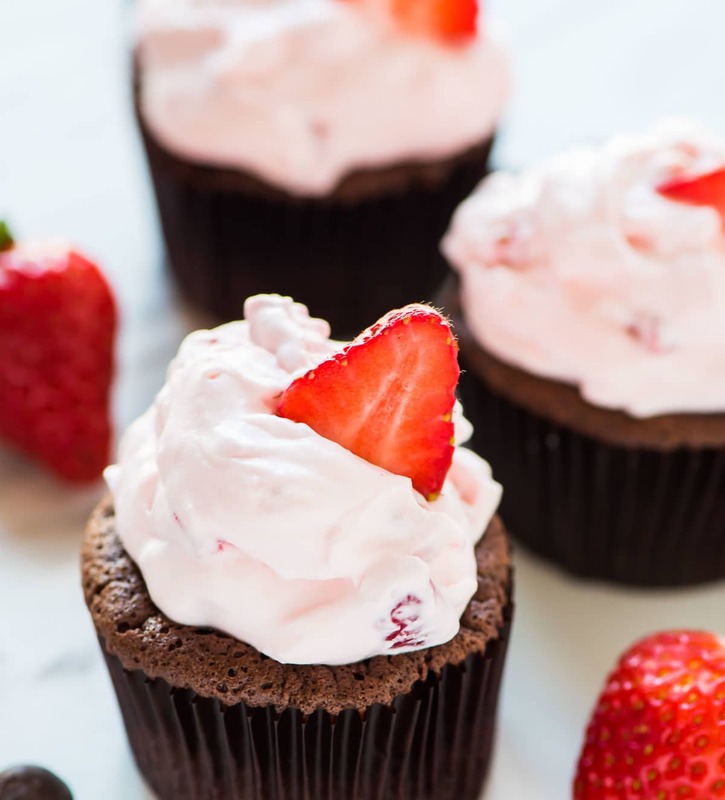 I am looking forward to celebrating tonight with dinner out, then enjoying a special dessert I stowed away in our freezer: Chocolate Mousse Cupcakes with Whipped Strawberry Cream Cheese Frosting. Our wedding cake was strawberry flavored, so every year for our anniversary, I make some kind of strawberry dessert to commemorate it. 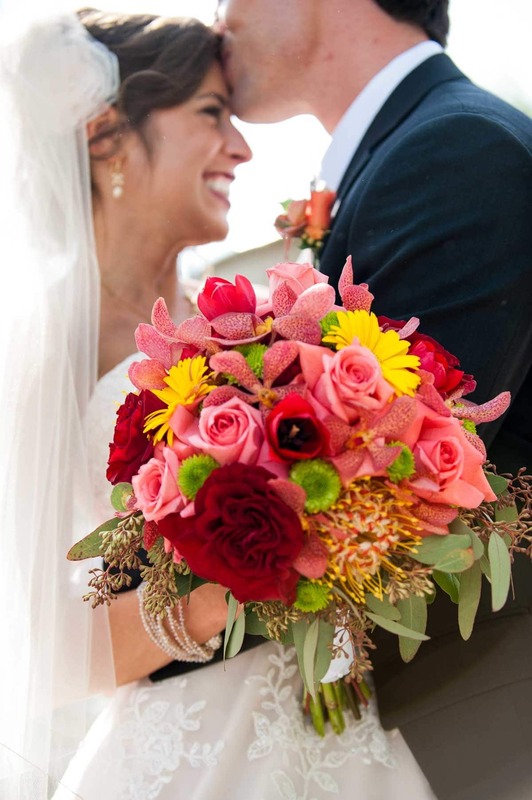 I actually started my blog the same year we were married, so if you have a lot of extra time on your hands (or you really love strawberries), you can poke back through the archives to see what I’ve shared. This year’s dessert is a bit of a cheat, because it’s more chocolate than strawberry, but these Chocolate Mousse Cupcakes are far too fabulous to waste time debating semantics. More like mini chocolate soufflés than traditional cupcakes, these mousse-inspired treats are light and airy on the inside, smooth and silky on the outside, and truffle-like throughout. The chocolate flavor is pure without being overpowering, and they are sweet-tooth satisfying without being sugary. They remind me of the chocolate mousse I had in Paris, but as someone who once (and only once) tried to make traditional chocolate mousse from scratch, I can tell you that these Chocolate Mousse Cupcakes are far, far easier to prepare. This recipe came to me via my stellar communications manager, Caitlin, who, in addition to keeping me sane on a daily basis, has a keen understanding of the sorts of desserts that speak directly to my heart. She sent me Deb’s recipe for Chocolate Soufflé Cupcakes with Mint Cream, and I knew immediately that some version of it needed to be in my life, STAT. I kept the base recipe for the chocolate cupcakes the same because, quite frankly, it is too perfect to change, but I swapped the mint cream with an ethereal whipped strawberry cream cheese frosting. 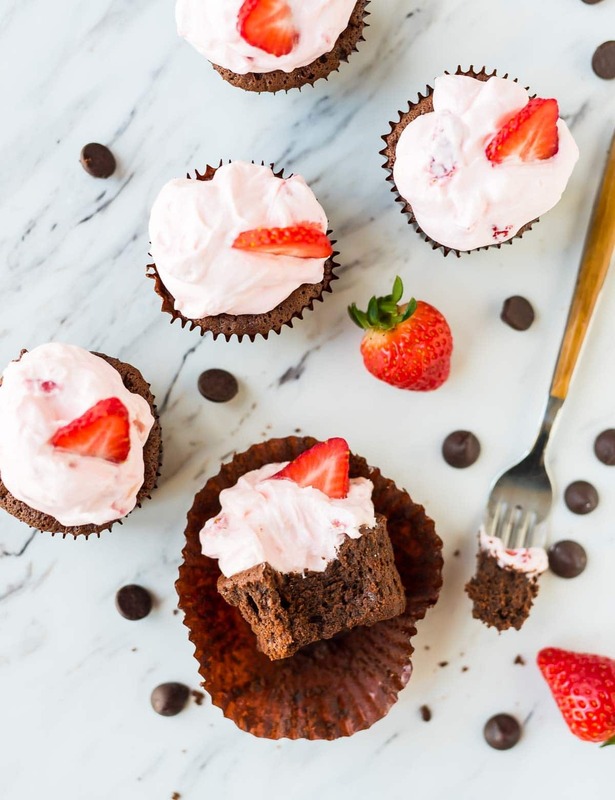 I’m sure the mint version is lovely, but honestly, I am so besotted with this cloud-like strawberry cream creation, I’m not sure that I’ll ever eat these Chocolate Mousse Cupcakes any other way. A better name for Whipped Strawberry Cream Cheese Frosting would be “Whipped Strawberry Cloud.” It’s lightly sweetened homemade whipped cream, folded together with cream cheese and fresh strawberries. It’s light, creamy, fruity, and categorically impossible not to eat directly from the bowl, so don’t even try. Pile as much onto the mousse cupcakes as you think they can hold, then polish off the rest with a spoon and a smile. In addition to sharing a strawberry dessert, I do have one other wedding anniversary tradition. Each year, I’ve posted something that I learned about marriage since saying “I do” five years ago. I don’t think I’d call this year’s blurb a lesson, so much as I would a moment of appreciation. I couldn’t be myself, either as I am today or who I would want to be, without Ben. Whether he’s stepping between me and my computer to give me a hug, lying on my side of the bed to warm it up before I climb in, or shoveling the driveway so that I can make it out for an early-morning grocery run, the quiet selflessness he displays inspires me to be the best-ever version of myself. His opinion is the one I seek first and respect most. We’ve been married five years, friends for twelve, and when I think of the decades ahead, I can’t picture my life any other way than without him in it. Yes, we have our disagreements. Yes, we are uniquely talented at driving each other crazy. And yes, I really do think my way of loading the dishwasher is superior to his. But, could there be anyone else I’d rather have make me nuts than this person for whom I already am? Never. Love you, Ben. Happy anniversary. 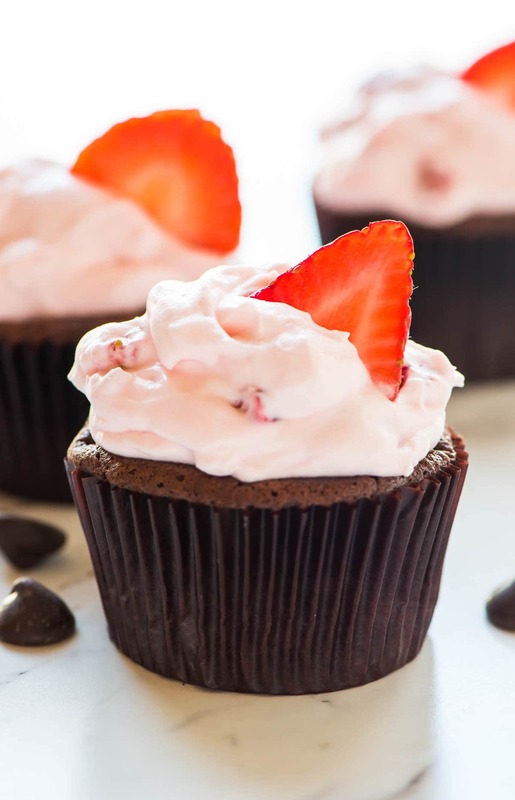 Chocolate Mousse Cupcakes with fresh strawberry cream cheese frosting. Rich, silky, and so much easier than traditional chocolate mousse! Heat the chocolate, butter, and espresso powder in a medium saucepan over low heat, until the chocolate is almost completely melted. Remove from the heat and stir until the chocolate is completely melted and smooth. Let cool to room temperature, stirring occasionally. In a medium bowl, beat the egg yolks and 3 tablespoons sugar with an electric mixer until the mixture is very thick and pale, about 2 minutes. (I found a hand mixer, rather than a stand mixer, worked best because the amounts are fairly small.) Add the cooled chocolate mixture and vanilla extract and beat briefly. Set aside. Clean and dry your beaters COMPLETELY. In a separate medium bowl, beat the egg whites until soft peaks form. Gradually beat in the remaining 3 tablespoons sugar and salt, and continue beating until medium-firm peaks form. Fold the whites into the chocolate mixture one-third at a time, fully and gently incorporating between each addition. Divide the batter among prepared cups, filling each a little more than three-fourths of the way. Do not be tempted to overfill, as the cupcakes will not bake properly. Bake until the tops are puffed and dry to the touch (some may crack, but they will still be delicious) and a toothpick inserted into the centers comes out mostly clean with some moist crumbs attached, about 15 to 20 minutes. Place the pan on a cooling rack and leave the cupcakes in the pan to cool completely. The cupcakes will start to fall almost immediately (perfect for the strawberry cream!). Meanwhile, prepare the whipped strawberry cream cheese frosting: In a medium bowl, beat together the cream cheese and 3 tablespoons powdered sugar. Add the strawberries and food coloring (if desired) and beat until well blended. Set aside. In a separate bowl, beat the heavy cream and lemon juice together until foamy. Increase the speed to medium high and slowly add the remaining 2 1/2 tablespoons sugar, beating until stiff peaks form. Fold half of whipped cream mixture into the cream cheese mixture. Once that is combined, fold in the remaining half. Remove the cupcakes from the pan and place on a serving plate. Fill each sunken top with an extremely generous dollop of the strawberry cream cheese frosting and top with a slice of fresh strawberry. Dive in or refrigerate until ready to serve. I know the recipe yield is a bit strange, and it may vary slightly based on the size of the cups in your particular muffin tin. Either over- or underfilling the liners does not work well. Fill them to slightly above three-quarters of the way as the recipe suggests and you will be golden. YES, you can double recipe. In fact, you should probably go ahead and do it. You will not regret your decision. If you do double the cupcakes, I'd suggest multiplying the strawberry topping by about 1 1/2. Store leftover cupcakes in the refrigerator for up to 3 days. I recommend adding the strawberry cream cheese topping just before serving (store it separately), but you can store them already topped too. Happy anniversary, Erin!! :) What a beautiful post about him. I love hearing about other people’s love and romance! 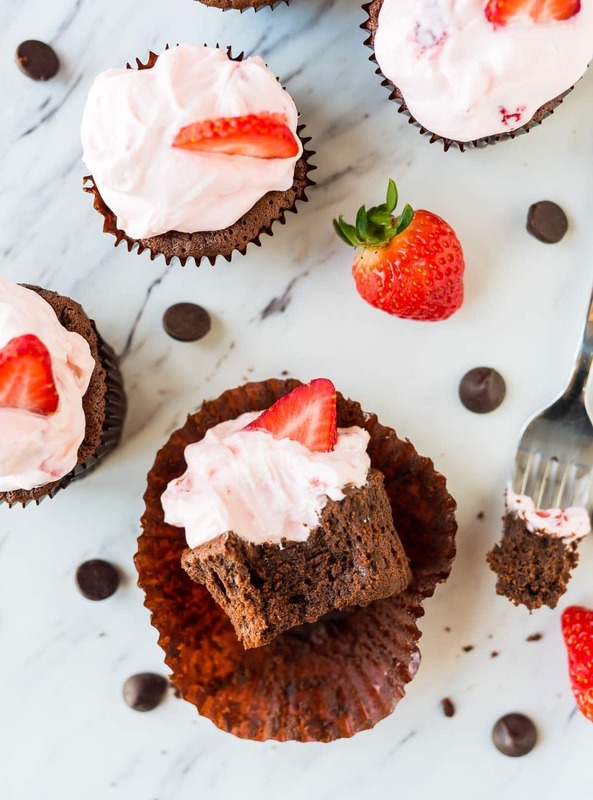 <3 These cupcakes look like the BEST way to celebrate! Hope you had safe travels back to the US! Thank you so much, Marina!! Being married for any length of time is wonderful but when you can put things into words that define it – now that’s something special. Have a memorable day with each other and many more in the future. Happy anniversary! So pleased to see the strawberry tradition continue. Congrats on five years and here’s to at least fifty more! Happy Anniversary! I look forward to these strawberry posts. Happy to hear my husband isn’t the only one who warms up my side of bed. Wishing you a 100 more years of happiness! Your husband sounds like a keeper too Sue ! Thank you so much for your sweet note. I hope you have a wonderful weekend! I’ve been married for 5 years this year as well and wish I could write to my husband as eloquently as you do to yours. Can’t wait to try these yummy cupcakes! Happy 5th Anniversary, Erin! May God Bless both of you with many more. <3 Thank you so much Janet! That is just so nice about your hubs – shout out to Ben!! #foodbloggerhusbands :) And thanks for another reason to introduce chocolate into my life – yet again!! Happy anniversary! Congratulations!!!! I hope to make this recipe with my amazing 3 year old grandson!!! He’s the Best! Congratulations on 5 Years! You do have a very unique and tender style of writing when it comes to Ben. So glad you shared this recipe — Chocolate Mousse is by far my favorite dessert ever and these look so do-able. And that strawberry cream cheese whip cream looks to die for! Have a fabulous anniversary and can’t wait to hear about the trip to Europe Erin-Style. I travel vicariously through your posts. Tami, thank you so much!!! 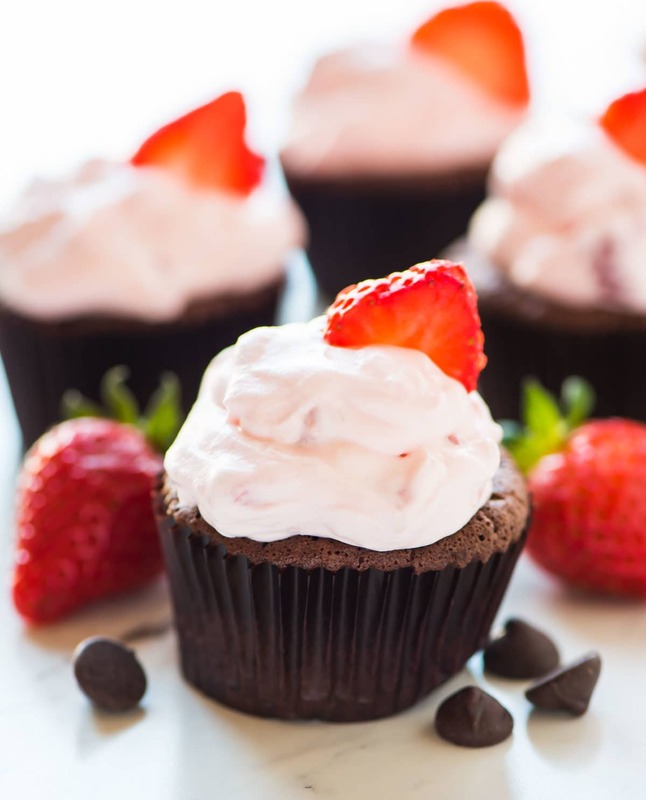 And if you are a chocolate mousse lover, then these cupcakes are definitely perfect for you. I hope you enjoy them! Congrats on 5 years! You said you stowed them in freezer: did you store the frosting separate? How long will they keep in the freezer? Hi Jordan! I actually didn’t freeze the frosting, so I can’t speak to how that would work. I do think that you could store them uncrossed safely for at least two months. I hope you love them! I have been following your blog for about 3 years now, and I love your strawberry tradition. Can’t wait to try these out. My favorite cake topping/icing combo is chocolate and strawberry, so this is right up my ally, and right on time for our own wedding anniversary. It’s been a pleasure to celebrate in matrimonial solidarity with you through these yummy strawberry delights. Here’s to many more! Sarah what a wonderful tradition! A very happy early anniversary to you. Thank you so much for your kind wishes. Enjoy your weekend! You young-uns are so mature in your outlook on marriage and life. How’d you get so smart so fast? Very sweet prose. Looking forward to taste testing your recipe. Hope you had a wonderful celebration. PS: Wish my husband warmed up my side of the bed–but only on cold nights. He’s quite the furnace. Belated congratulations on your anniversary – I want to comment on these cupcakes that they are the most divine thing in a gluten free chocolate I have ever made! The frosting was like a strawberry mousse, yes, I seriously sat and ate some of it directly off the spoon. The combination was wonderful but even with a bit of whipped topping on the cake they were awesome. I followed the recipe to a “T” and I till got 16 cupcakes??? but they all turned out fine, I froze some of the cakes and have eaten 2 of them since and they were still delicious. I did not freeze the frosting in time so I felt like the heavy cream would be going bad soon and didn’t take the chance so I did lose some of it to the disposal- but I will absolutely be making them again!! Thank you for the GF options you give, I love them and love your site. Cherie, I’m so glad to hear you loved the cupcakes! Isn’t that strawberry mousse so delicious? Thanks for reporting back with how many cupcakes you got…I guess it can really vary depending on the size of your muffin tin and how full each one is filled. I so appreciate your taking the time to leave this awesome review! Hi Erin! I think I am going to bookmark this for both the recipe and the very touching words about your husband (they truly spoke to me)! Congratulations! One question – coffee is one of the two things I cannot stomach (the other, sadly, is cilantro), which is a travesty for a whole host of reasons. Is there something that you can recommend instead of coffee? Eileen, the fact that you saved this means the world <3 You can simply omit the espressso powder. The cupcakes will still be delicious without it!